Finally nothing bad to report here! After the last two months (17 and 18), I very much welcomed a month with no new sicknesses. He did get two new teeth (his top eye teeth) this month, but per usual, it wasn't that big of a deal. His hair was as crazy, beautiful as ever (see pictures below) and we just generally had a really good month! Finally got this kid to eat more! He still really wouldn't eat much for breakfast (usually just fruit) because he nursed for a while when he first woke up. He would eat a really good lunch. Dinner was hit or miss. Sometimes he would eat a lot and other times he barely touched any of his food. I never really made a conscious decision in regards to how I would handle eating situations with Myles; I really just fell into the thought of not pushing it on him. I don't see any point or reason to force him to eat or punish him for not eating. I ask him to please eat more or try a certain food, but when he tells me he is done, I let him be done. 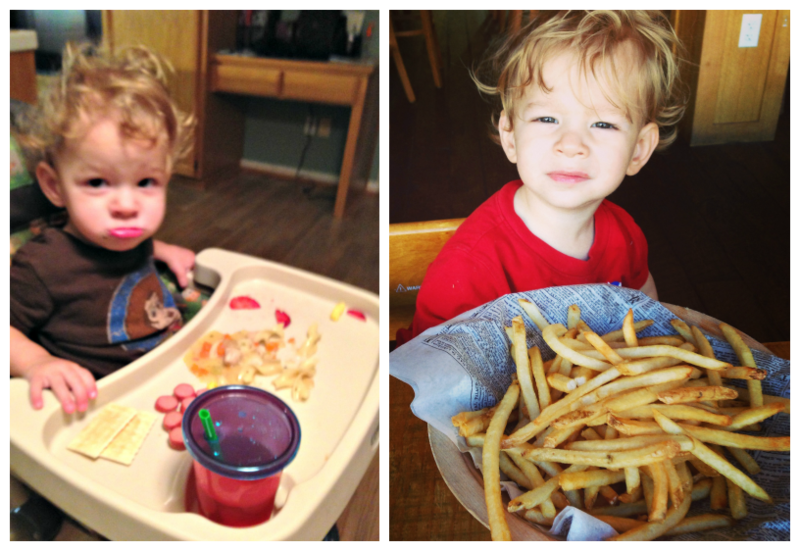 Some of his new favorites this month: eggs, cheese, fries, fruit snacks, jello, and noodles. Turkey dogs and fries (we shared)! 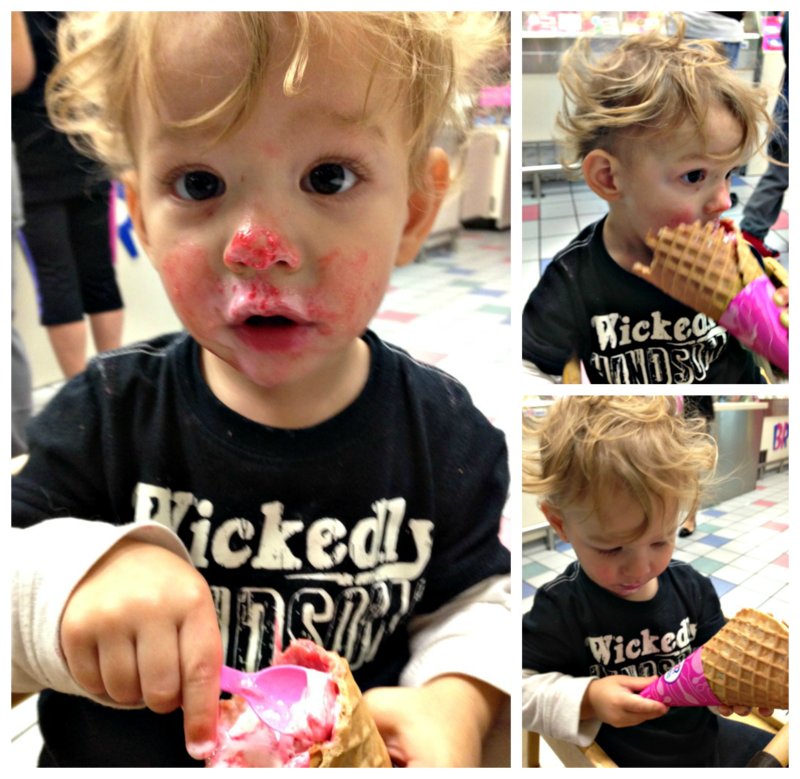 He also got to taste his very first ice cream cone. I actually didn't plan on getting him any because he never ate any when I would offer him some at home. I bought a cone for myself and then gave it to him to let him try... and I never got it back! He has yet to ever do this again though. Still breastfeeding of course. In the morning he would wake up crying. I would go get him and bring him back into bed with me to nurse for about an hour (mixed with playing). Then he typically wouldn't nurse again until nap time. I talked last month about how we were weaning our daytime nursings and that continued to go well. It was very rare that he would ask to nurse during the daytime now. He would nurse throughout nap time and then again right before bed for 10 minutes. I was very happy to finally be down to 3 times a day. It was beginning to take a toll on me when he would still want to be nursing all day long. It took a couple of months because I really just let him do it on his own (with a little distraction and redirection from me), but he did great and we adjusted well. I honestly can't really remember any specifics this month on sleep. His schedule has pretty much been the same since he was 12 months. Bed time from 9pm-8am and one nap from 1pm-3/4pm. At the beginning of this month I took Myles to the Exploratorium to celebrate his half birthday. Okay.. I am sure some of you may think that is a bit crazy but I love to celebrate any/all milestones. It's not something I will do forever, but at this age with so much growing and learning, even just every six months can feel like a whole year has gone by. He didn't get gifts or a cake or anything; just took him to a fun place. We invited our friends Cameron and Leesa to come. 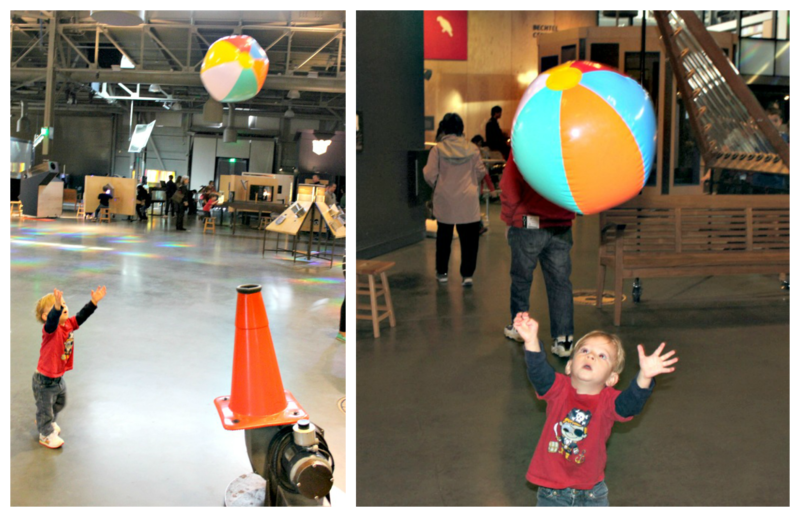 The Exploratorium is a hands-on, science based museum. So even though most of the stuff there was way above their age, the boys had fun with what they could play with. Myles, of course, spent most of his time playing with the beach ball that was being held up by air. He couldn't figure it out and would get mad until I dropped the ball down far enough that he could reach it. He couldn't understand how the ball was up so high in the air. Pretty much the greatest part of my day! 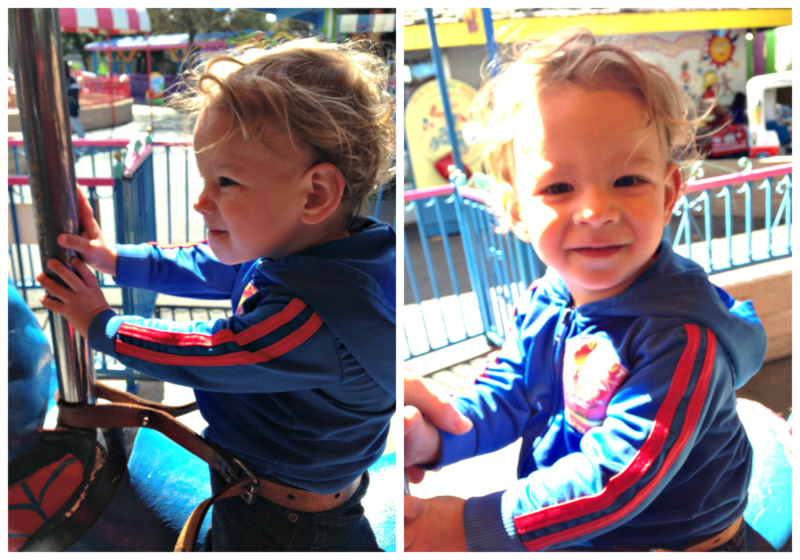 We also spent a day at a small little amusement park with Cameron this month. They loved the train the most and Myles enjoyed this carousal ride. Lots of park time, of course. Our dog is getting very old and can't walk a lot so we don't take him to the park very much, but when we do it is a total treat for Myles. This was the first time he got to 'walk' him around and he thought it was the coolest thing ever! My dad came to visit us this month too! We loved having him and Myles loved that there was another person to take by the hand and lead around to every place he went all day long. We took a trip to San Fransisco, lots of outdoor time, and playing around the house. 99% of all the parks out here have climbing walls. It wasn't ever anything I noticed in Illinois, so I guess it is just a popular apparatus in California. 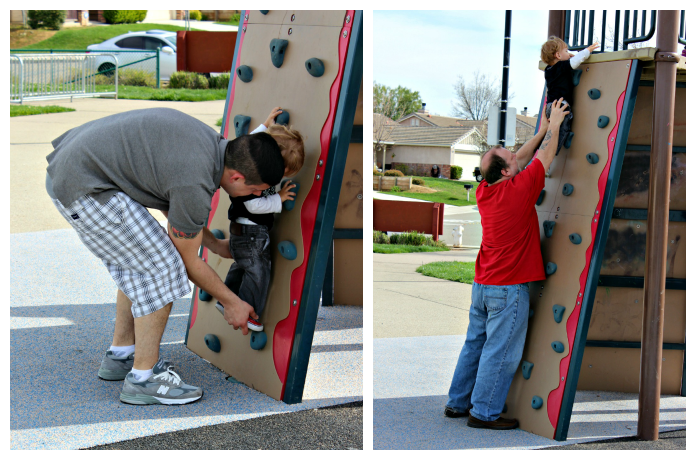 Myles had wanted to climb up this wall so badly the first couple of times we went to this park. I am not tall enough to help him get very far up, so when daddy and grandpa came along, he took full advantage of their height. He was so happy and proud of himself for making it up. And in true Myles fashion, he wanted to do it over and over and over! Okay so this is a really silly mommy moment, but I had to. No Myles is not going to school or daycare... I just had to buy this cute Elmo backpack for him (since I stopped carrying a diaper bag) and when he asked to put it on and walk down the street, I had to take pictures. So ridiculous, I know, but also ridiculously cute! Lifting weights of course! My dad is just as goofy as us so we love having him around. He put Myles' shoes on the end of a metal pole and told Myles it was for lifting weights. One of the cutest things I have ever seen! 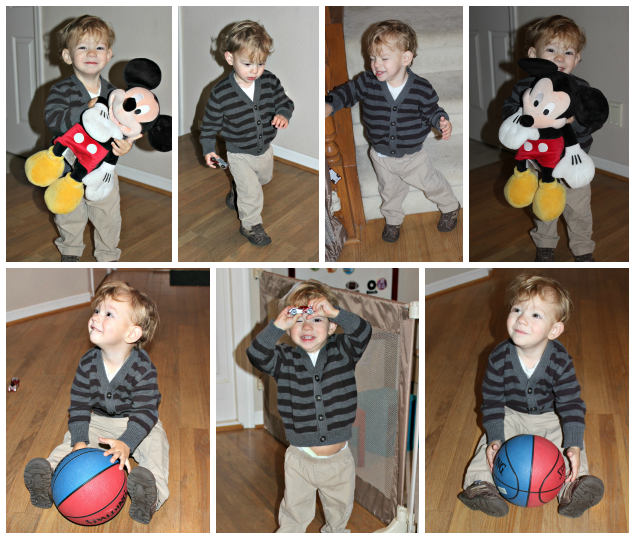 We finally got Myles his first basketball hoop and he made his first basket! 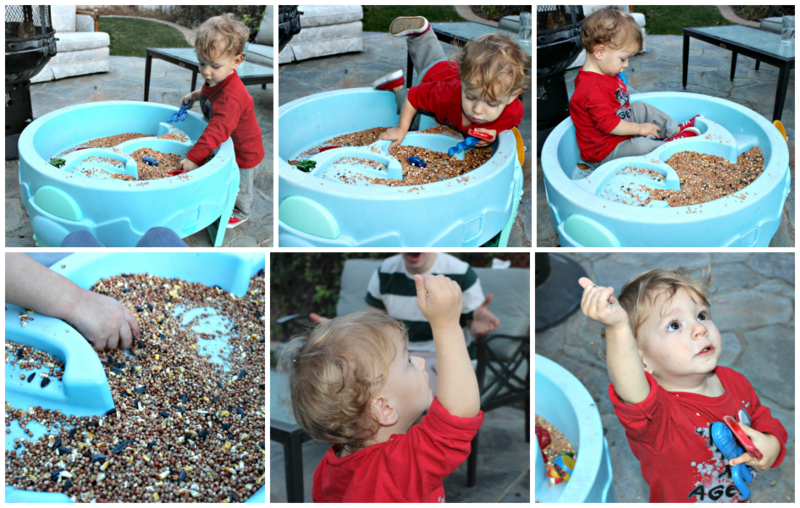 We also used our water table for some bird seed playing. Mark got me a bird house and seed for Valentine's Day and Myles quickly took to being the resident bird seed handler. First we played with it like sand, then we sat in it, and then we grabbed handfuls and reached to the sky to try and feed the birds! I have been wanting to share some home decor posts for months now (we have been in our new place for a little over 3 months), but nothing is finished to my complete liking so I have been waiting. Well I think I have come to realize that in my crazy OCD mind no room will ever be completely done. 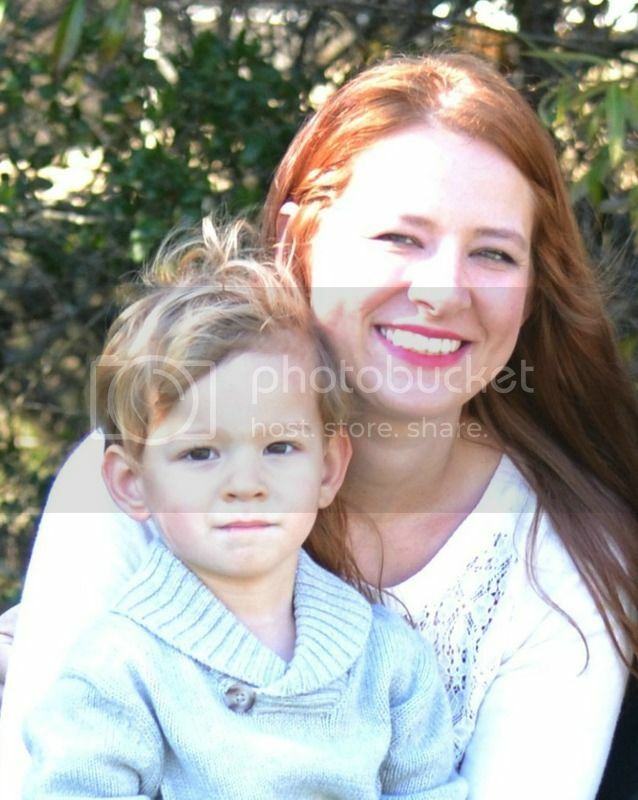 Some areas I am at a total loss and need some advice (an upcoming post), but mostly it's just that I am not not finding exactly what I want. I started this project like 2 months ago! It took me a long time to decide on what exactly I wanted to have on the wall. Then I had to pick out colors.... From there I couldn't decide which color I wanted on which item... then I had to actually paint them (which took the longest time)... and finally I picked my favorite layout. I moved them around at least 25 times. Then I slept on it and woke up the next day and changed it another 15 times. I am really happy with my final choice. I love the way it looks currently, but I am also able to add more if I want to later. The colors come from the rug in his room (which I forgot to take a picture of this time). The first thing I bought for the room was the rug and then designed the whole room around the colors in it. 1. A canvas that I wrapped in fabric (same fabric I used for the chairs of his Ikea play table). I painted the 'M' (from Micheal's) orange and glued it to the canvas. 2. A cheap picture frame I painted and glued the clothes pins to. This will be for Myles' art. 3. I got this shadow box at Goodwill. I painted it and attempted to put some of Myles' hot wheels in it, but he freaked out and made me take them all out. So I am still brainstorming something I can put in it.. any ideas welcome! 4. I painted this canvas and attached this free USA map printable with sticky Velcro. 5. Chalkboard I had from who knows where that I painted.. and have yet to write on! 6. This piece is the reason I decided to make a gallery wall. I based it all around this picture. It is a picture my mother colored for my cousin when she was born. It was a color by number picture but she just did her own thing. A couple of years ago my cousin found it and gave it to me for Myles. I found a frame to put it in at Goodwill and painted it. 7. Canvas painted with clothes pins glued on it for Myles' art. 8. 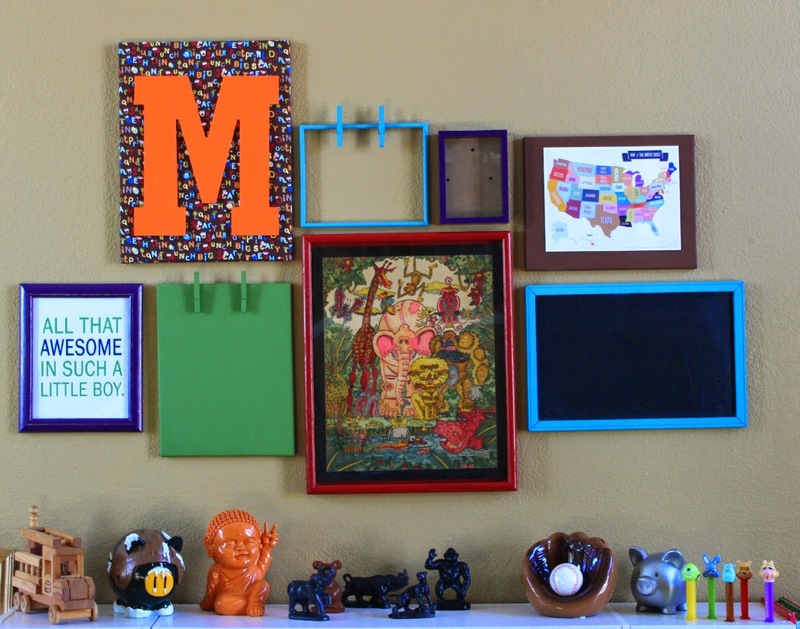 Painted frame with this free printable. The other thing I put together in his playroom is this Toy Story corner. 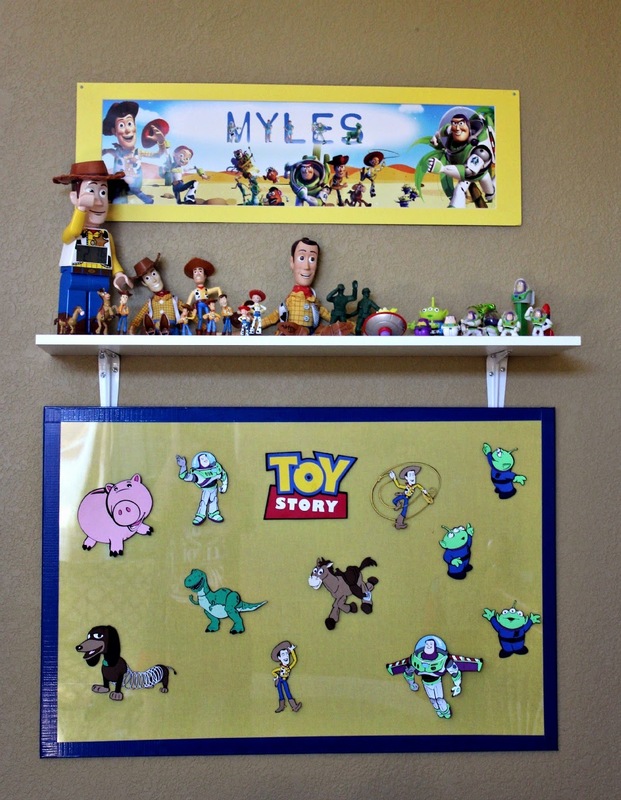 Myles had a Toy Story birthday party this year (still needing to blog that!) so I had a ton of Toy Story things left over. My great friend bought Myles this personalized banner! 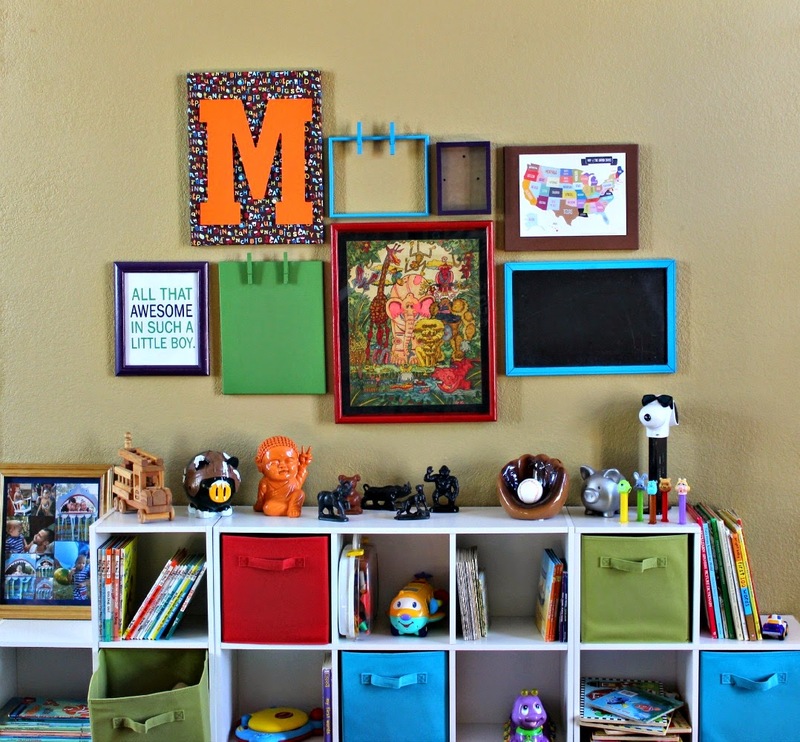 I LOVE it and knew I had to put it up in his playroom. Under that I added a white shelf to display all of his Toy Story figurines (mostly Woody and Buzz). And below that is a board I made for the die-cuts that I had left over from Myles' party. I ordered these die-cuts for center pieces on each table. 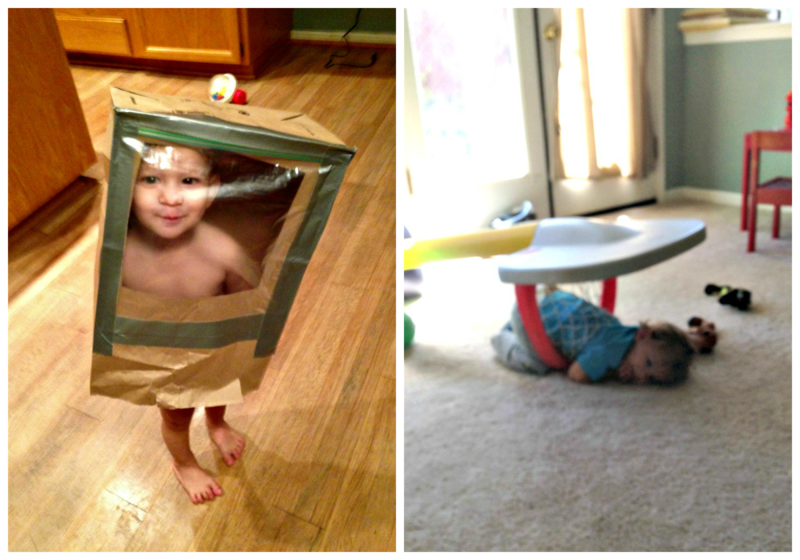 I didn't want to just throw them out because they are really good quality and fun to play with. I started with an old poster frame we had laying around. I glued yellow fabric to the back board and attached the plastic front with blue duck tape around all of the sides. Lastly, I used sticky velcro dots to attach each die-cut to the board. That way he is able to take each one off, play with them, put them in different places, and they will always go back when he is done. We are huge Toy Story fans, so this little corner makes me happy! Sorry for the poor quality of these pictures, the lighting is horrible in his room. 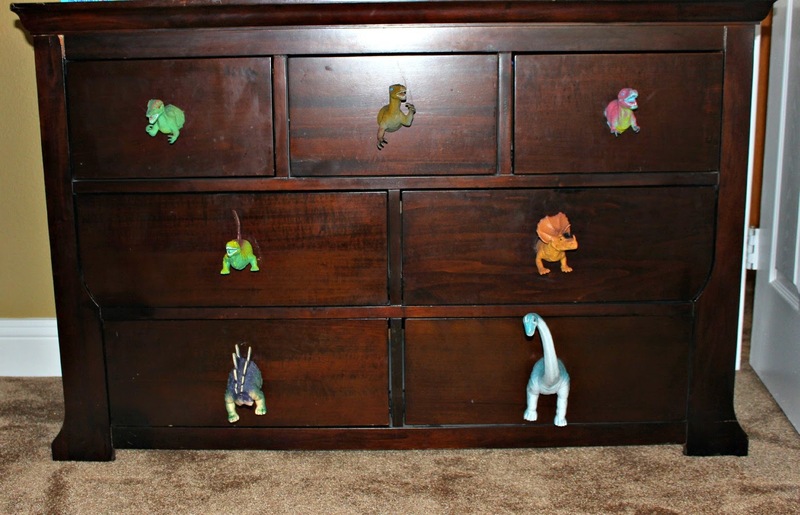 I had been collecting different dinosaurs from all over (thrift stores, garage sales, etc.) for a couple weeks and when I had them how I wanted I cut them all in half. 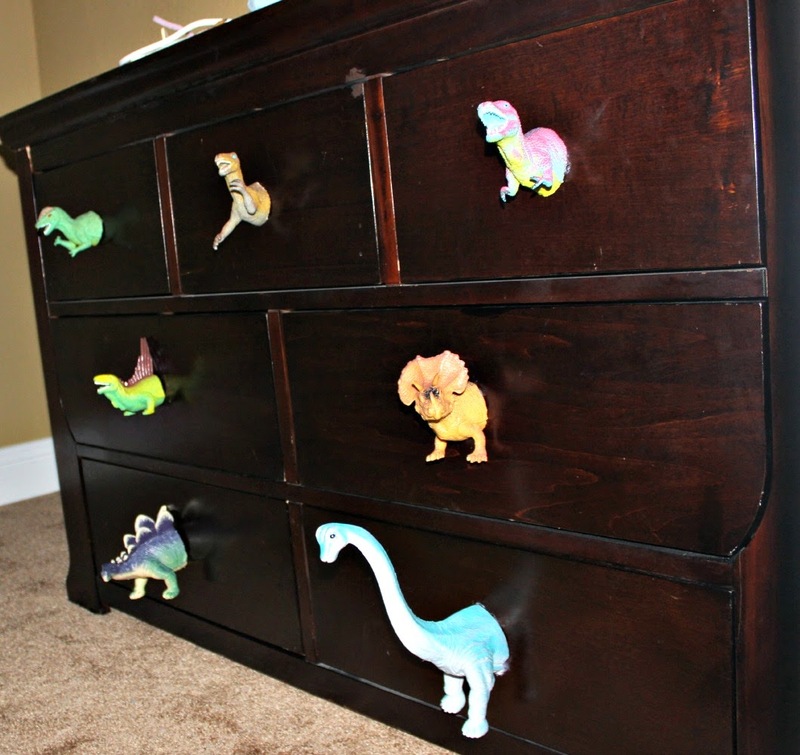 Once I did that, I took them all to the hardware store and found cheap wooden knobs that fit each one the best. 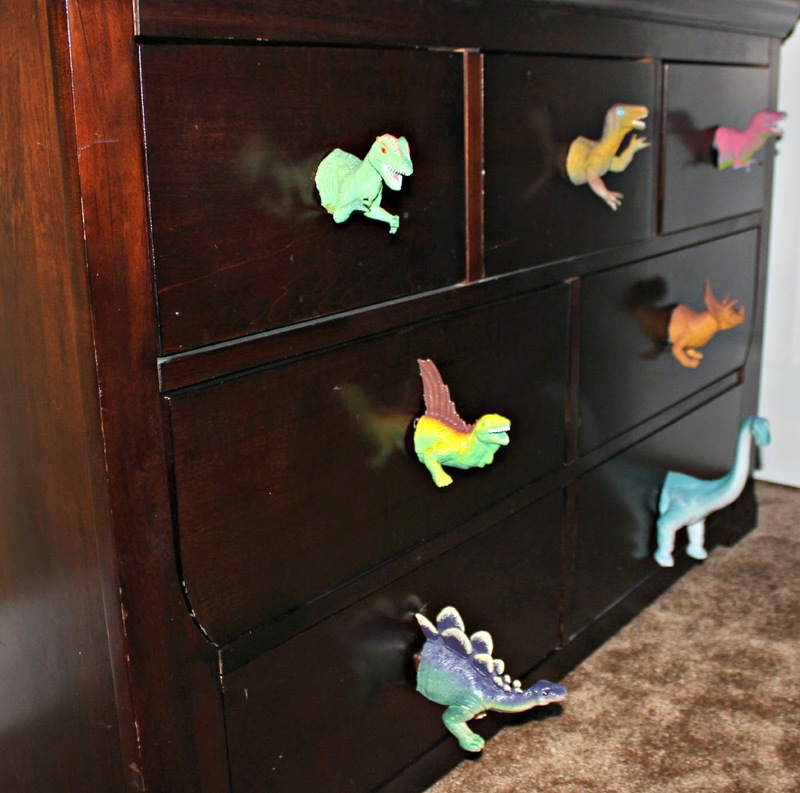 Then I glued the dinosaurs to the knob/drawer. Just a fun little touch to his room! 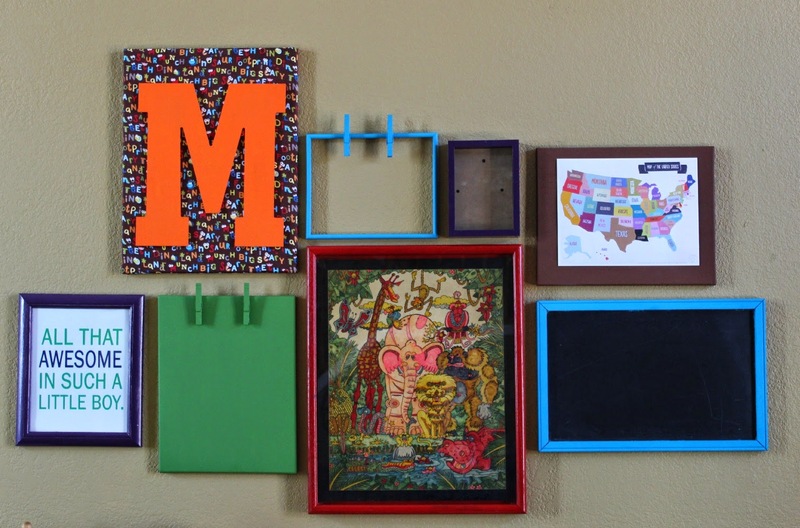 What kind of projects have you been working on around the house? Many of the items on this month's list were Christmas presents. 1. Elmo's Big Lift-And-look Book: Myles got this book from my uncle for Christmas. I love when other people pick out gifts for him because they are usually things I would never think to buy, but he ends up loving them. This book instantly became Myles' favorite book of all time. I think he loves it so much because 1. it's Elmo 2. its a flip book. He gets so excited when he opens the flaps and sees the surprise inside. I love it because each page teaches something different: shapes, colors, opposites, letters, and numbers. 2. GoodNight Moon Cuddle Bunny and SesameStreet Take Along Elmo: It took a while, but Myles finally found some lovies. Myles got the little Elmo from my grandma for Christmas and the Goodnight Moon bunny came as a gift at my baby shower. I really can't pinpoint exactly when it started, but around 17 months he began sleeping with both of these every night. 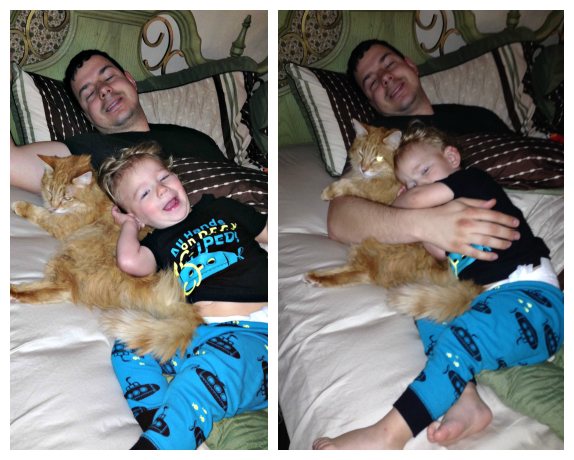 He became very attached and had to make sure both of them were in his bed every night before he went to sleep. They are both the perfect size for a toddler to cuddle and sleep with, and cart around everywhere else as well. 3. PixarBook Block Set: I picked this set out at Barnes and Noble with a gift card that Myles and I got for Christmas. I am always so at a loss when it comes to picking out books for Myles. His favorite books are all so different, I never know what will peak his interest. I could spend hours at the book store and end up with absolutely nothing, so I was very proud of myself for actually picking something out, taking it home, and not returning it! I love these book blocks because they come with 12 books, so you get 12 different stories for the price of one! They are short (like 6 pages), but they are perfect for little ones to 'read' on their own and keep their interest. 5. TechDeck Fingerboards: I'm not even sure where this came from. I just remember finding it in our house somewhere and Myles instantly took to it. It was perfect timing that I found it when I did, because we had just bought him his own 'flippy' (aka skateboard) and helmet. I love these fingerboards for little ones because they are small, keep them entertained, and help work on fine motor skills. I'm pretty terrible at using them, but Myles' dad showed him some awesome tricks that Myles has copied. Now that Myles is older, he likes to put his action figures on the boards and pretend they are skateboarding. 6. HotWheels Dino Spinout Track Set: My dad got Myles this set for Christmas. 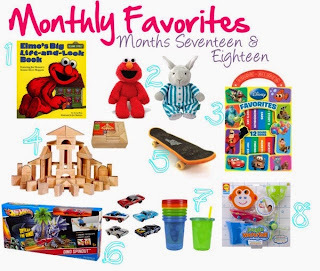 I had been thinking about getting Myles something Hot Wheels for a while, wondering if he would be into them at all. He was starting to play with cars more and he loves when things crash, so we decided on this Dino set. It was so perfect for him! The set-up is super easy and all you need is a higher table/ledge to connect the track to. It is great for younger toddlers because it doesn't require them to do anything but put the car on the track. The car goes down, crashes into the dinosaur, and the dinosaur falls over. I have even joined in on the fun from time to time! We have a couple more sets now, but this one is still our favorite, by far. 7. TheFirst Years Take & Toss Straw Cups: A friend had these at her house and I thought they were the perfect little cup. I went to buy them at Target and was super impressed with the price too. You get four cups, tops, and straws with the normal pack. I'm not really sure if these are supposed to be disposable because they are called 'Take & Toss' but we have kept them for more than 8 months now. We have 3 sets left (lost one) and they are still in perfect condition. I always had a had time finding sippy cups that worked how I think they should. I bought a ton of different ones and Myles only drank out of a couple of them. He really only wanted to drink out of a regular cup so after tons of spilled liquid, I was so relieved that I found these cups and he actually drank out of them! Super durable, easy to drink from, and inexpensive; my kind of cup! 8. ALEXToys Bathtime Fun Jungle Water Fall: We didn't buy Myles too much for Christmas because he got so much from our family already and we weren't even going to be home for actual Christmas. 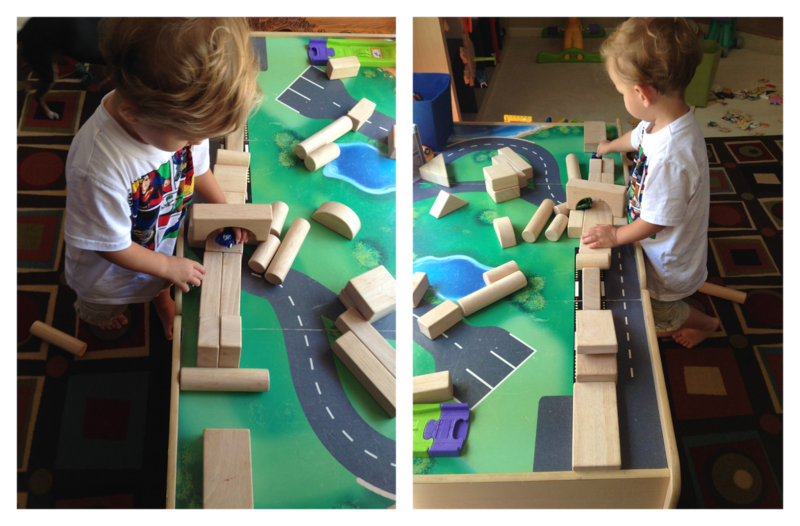 I did buy him a train table and train set for his big present and then got him just a couple of small things. The only thing I thought he really needed was new bath toys. I find that bath toys are the hardest toys to pick out. I never like any of the selection when I go to the store and I'm not even impressed with what is online. It was extremely difficult for me to pick anything out because I couldn't find something that really 'wowed' me and I really wanted something cool for him to open at Christmas. I eventually decided on two: this jungle waterfall and the Little People Play 'n Float Bath Boat. I totally lucked out with the waterfall because Myles really loved it. It comes with 4 pieces that you stick on the wall vertically so that water flows through each piece and eventually into the tub. Each piece is different and funnels the water through it differently, so it is very visually stimulating and fun to watch. It also comes with a cup to pour the water out into the top of the waterfall. The only part that I didn't like about this was that at his age, Myles wasn't able to scoop the water up and pour it into the top by himself. 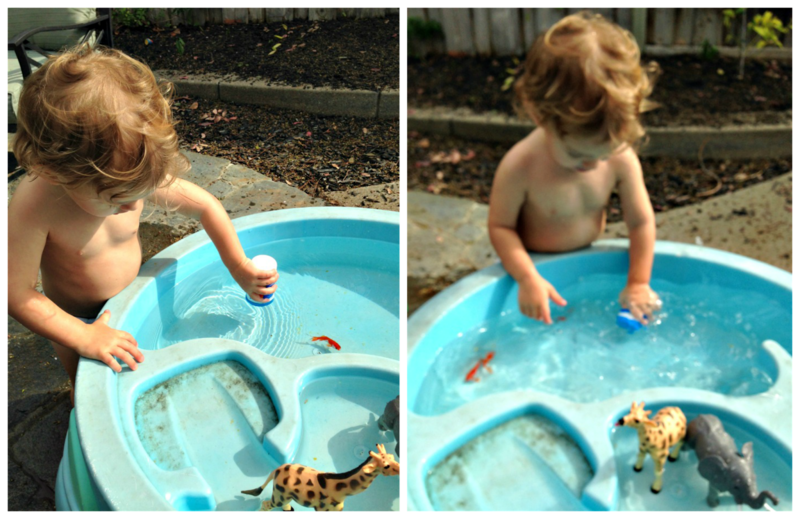 He would always end up dumping the water out before he got it to the top, and so I had to do it for him. And if I didn't do it over and over and over, he would get super upset. So I guess he liked it that much! So by the title of this post it may be concluded that I have a problem... and normally I would try to justify this problem with some sort of excuse about how our first pumpkin patch was in Illinois so I had to go to another patch out here in California, but let's be real here people.. I have a thing for pumpkin patches and I also have a Type-A thing that makes me have to check out every single patch, museum, festival, park, etc. in existence. So here I am today sharing with you guys our second pumpkin patch experience (first in California). And if I am being completely forthcoming, I have even since taken Myles to a third pumpkin patch! I'll spare you a third post though and just get to this one! 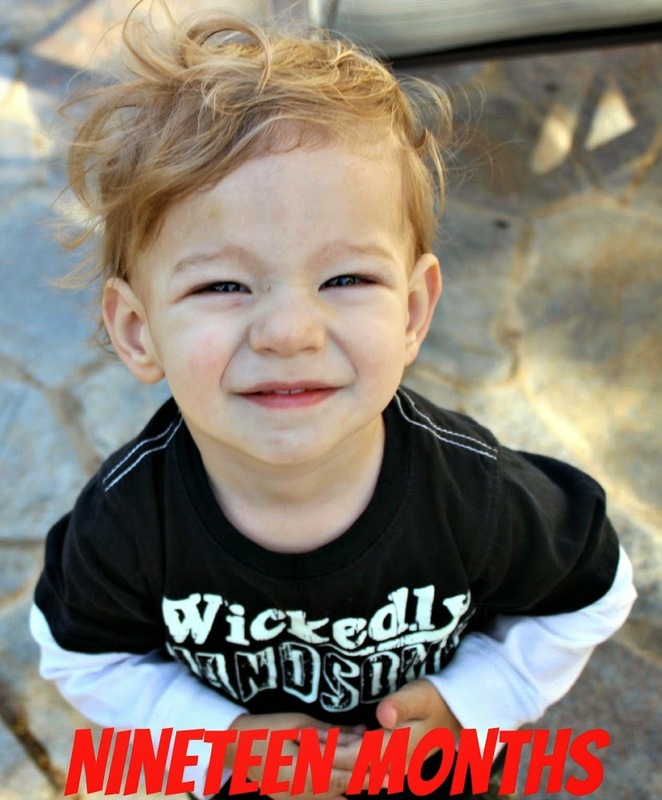 I am also linking up again with two of my favorite blogging buddies: Elizabeth from Chasin' Mason and Desiree from Macke Monologues for their Fall Family Bucket List. All in all, this patch was pretty cool as far as activities goes... but we didn't have that great of an experience because of the weather. It was just so dang hot, and while Myles seemed to not be bothered by it, I was miserable. Thinking that it was finally starting to cool down a bit, I dressed us both in pants and t-shirts. The weather here is so different than what I am used to so I am always dressing wrong. It will be a cool and cloudy 60 degrees in the morning and then by noon it's clear skies and blazing hot. I haven't figured it out yet, so it was my mommy fail on this one! Shorts would have made the trip a lot more enjoyable, but we hung in there and did the best we could. Straw maze: I was super surprised that Myles spent tons of time in this maze. I didn't think he would even walk through it, but he was running around, crawling through holes like a regular farm boy! I'm not really sure why, but they had a reptile show going on in the barn that day. There were tables lined with snakes, spiders, scorpions, and other creepy crawlers. Myles touched this snake a couple of times. At first he touched the tail and I missed the picture so I asked him to touch it again. Then he reached for its head (this picture was taken right between him touching the tail and then going for the head), the lady jerked back, and Myles got a little freaked out. I guess she wasn't expected that as most people know not to go for the head, but Myles really had no idea and was scared by her reaction. After that he was done with the snakes. They also had some aquatic life to touch like this sea star. I love that Myles is so willing to touch things, check them out, and not be scared. It makes everything much more interesting and fun. They had a little area with animals that we checked out (really dirty though) and tons of crafts that we bypassed. We did grab a really good lemonade though before we headed to the hayride out to the pumpkin patch. And then we finally made it to the patch! Slightly deformed, still partly green, and rotted out... but it was perfect! Have you spent the day at the pumpkin patch yet?